G-d gives each person a special talent that he or she may utilize in doing mitzvah. Debra Stewart has managed to utilize that special gift by helping Jews. Bringing her rich abilities in therapy and weaving, she has combined it with her love of her people. She has managed to combine it all in a most meaningful occupation: therapy and weaving tallisim. Debra was born in Worcester, MA. Her parents were reform Jews who brought her and her sister and brother up as reform Jews. Her brother went to Israel to join in the Six Day War effort and came home with his bride to be, and subsequently became an Orthodox Jew. He then became a Hassidic Jew and moved to Baltimore, MD. Her sister and her family remained reform Jews. Debra also remains a committed reform Jew. Even her secular education has brought her much closer to the pride of her heritage, having studied the holocaust and been involved with history in the Shoa Foundation. At Emerson College she studied speech pathology and audiology. Her study of the holocaust and European history has given her a special depth of understanding of the history and plight of Jews. Teaching it to youngsters is a great gift. She has taught history to special needs high school youngsters for several years now and is also a registered educational therapist with a private practice in Newton, MA. Her interest in fiber began many years ago, and she reckons that she probably has yarn in her veins instead of blood. This became apparent when she began to weave back in the 1970's and early 1980's - before the booming craft era. She opened a shop in Stockbridge, MA and sold clothing accessories that she wove. At the same time she became a teacher of the deaf, teaching weaving to youngsters of 8-9 years old. Teaching these hearing impaired children was a great challenge. She had been approached by the parents, but was not well versed in sign language yet. It was wonderful to watch the children light up when they began to make their first piece of fabric - it provided them with another opportunity to communicate through art, rather than spoken language...something all artists use. It was not art therapy, per say, but it gave her such an incentive to move onward toward working with people with disabilities. Then she began her experiment with tallism. Her extremely Orthodox brother sent her a book on the Tallit, which gave her all of the information that she needed. 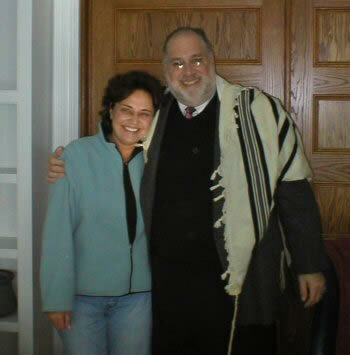 Although he would only wear a white and black tallit, he was still her first client. At this point she married and moved to Maryland, and attended George Washington University for a Masters in early childhood special needs. Her husband was a brilliant man with cabinet making skills that would put these reality television home makeovers to shame! Her husband had an untimely death. He had many tools from his cabinet making, and she sold them. Debra then moved back to Brookline and began study of the holocaust. She bought a beautiful loom with money she garnished from selling her husband's tools, and began to put her life and that of her two-year old baby together. As she pursued post-graduate work at Harvard, she began teaching adolescents with special emotional and behavioral needs, and became interested in utilizing her weaving together with teaching. She has always felt drawn to those with handicapping conditions as well as speech problems. Her intent was to work as a speech therapist in a hospital setting. She attributes this to the love she had for a neighbor in Worcester when she was five or six years old, who had suffered a stroke. The only two words he could say were her name and candy. Everyday she would visit him and he would offer her candy and say her name. No one could figure out why she was the only one that he could identify with. In regard to the neighbor who had the stroke, she remembers clearly wanting to work with people like that when she got older. He had a great impact on her as a child. Debra chose to work with children as opposed to adults only when she opened her store in Stockbridge - which was during the period between her bachelor and masters degrees. Her undergrad work was aimed toward adults, and after working with children who were hearing impaired utilizing weaving at her shop, she fell in love with this type of work, so she pursued it for a Masters. In terms of success stories, she has many newspaper articles about the programs that she started and worked in. One article is about developing a program at a homeless shelter with her special needs students. She decided on weaving tallism because having been brought up as a reform Jew, she always saw the narrow black or blue striped tallit, recalling when her brother became Orthodox and Hassidic, she was enthralled to see the difference in his garment. 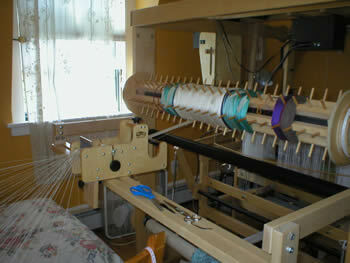 Being a weaver, she pursued that as a challenge. This later became a focus - since she views everything in terms of color.